I’ve lived way too long hearing about, being tempted by, but not cooking Cuba’s national dish, ropa vieja: shredded beef stew. Finally, last week I immersed myself in a week of research and recipe testing. 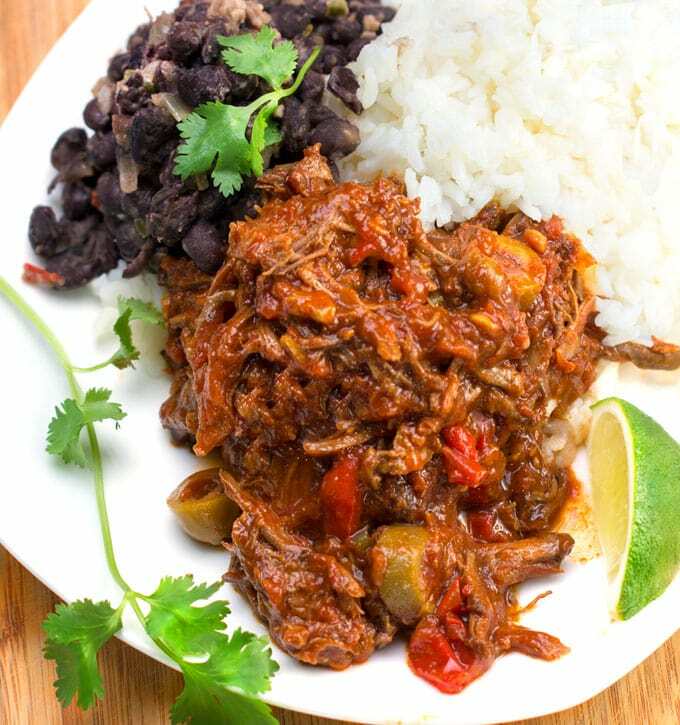 The happy outcome is this scrumptious recipe for slow cooker Cuban ropa vieja. 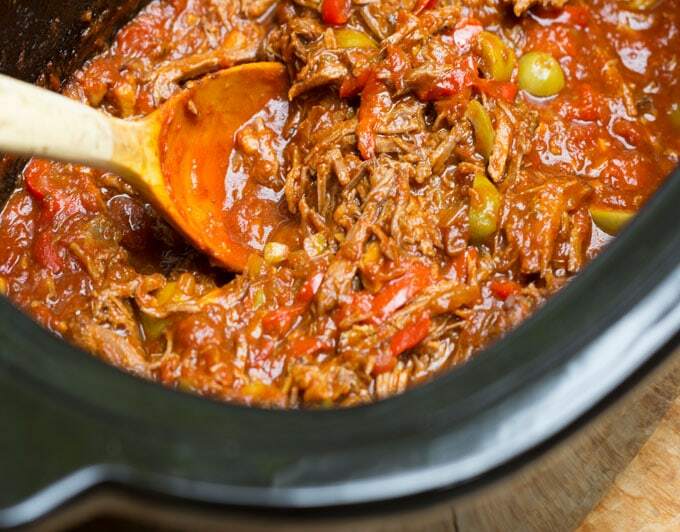 Ropa Vieja means “old clothes” in Spanish. Old clothes tend to be shredded and so is the beef in this stew, hence the name. This kind of dish is perfect for the slow cooker. The long, slow braise tenderizes the meat and allows all the wonderful flavors to soak in. My slow cooker lives deep in my pantry closet where it often stays for months. Occasionally I remember it’s there, pull it out and fall back in love. It’s great for those busy times when there just aren’t enough hours in the day (my life lately). I love knowing the crock pot is chugging along for me all day long. In a matter of hours, while you’re off getting work done or (even better) enjoying the lazy days of summer, solid hunks of beef simmer with onions, garlic mild fruity peppers and a deliciously spiced tomato sauce. 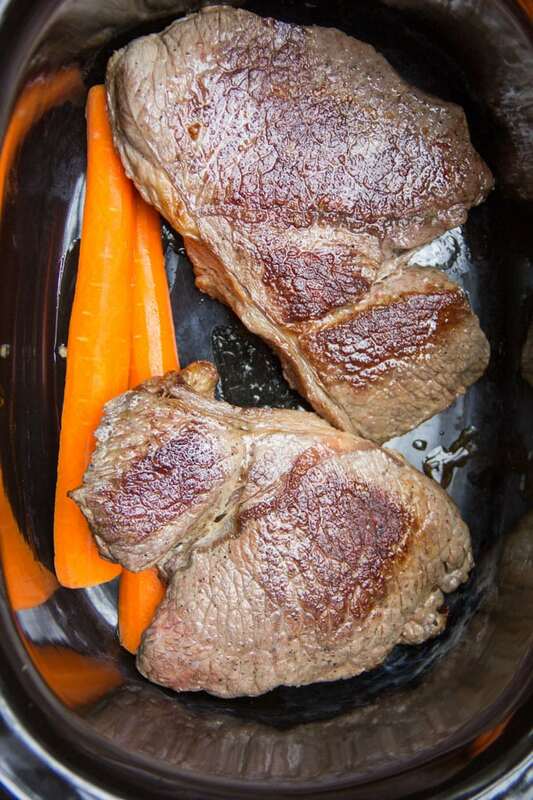 The meat is transformed to a beautiful tenderness, easily pulled into shreds using two forks. 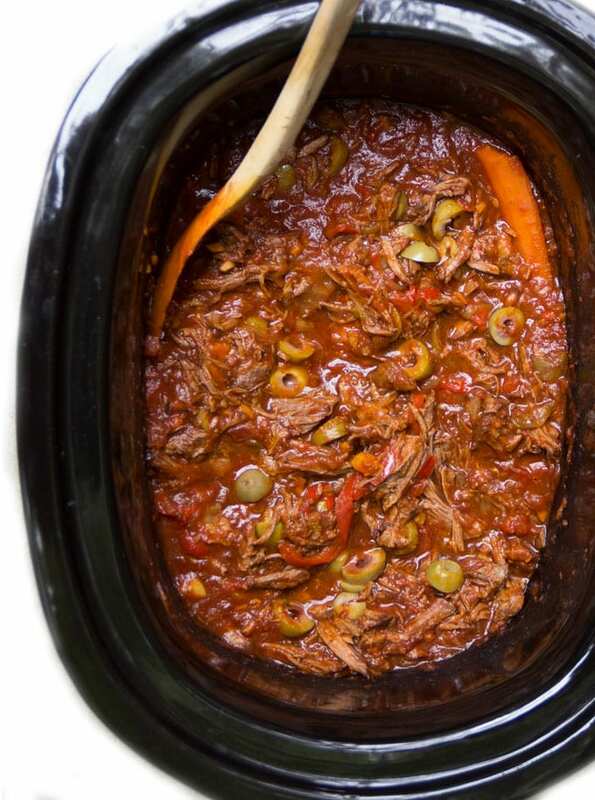 After it’s shredded, the meat goes back in the slow cooker for a half hour more, along with some sliced olives and a splash of vinegar, to build that final layer of flavor. The result is the most tender, succulent and irresistibly delicious shredded beef stew! 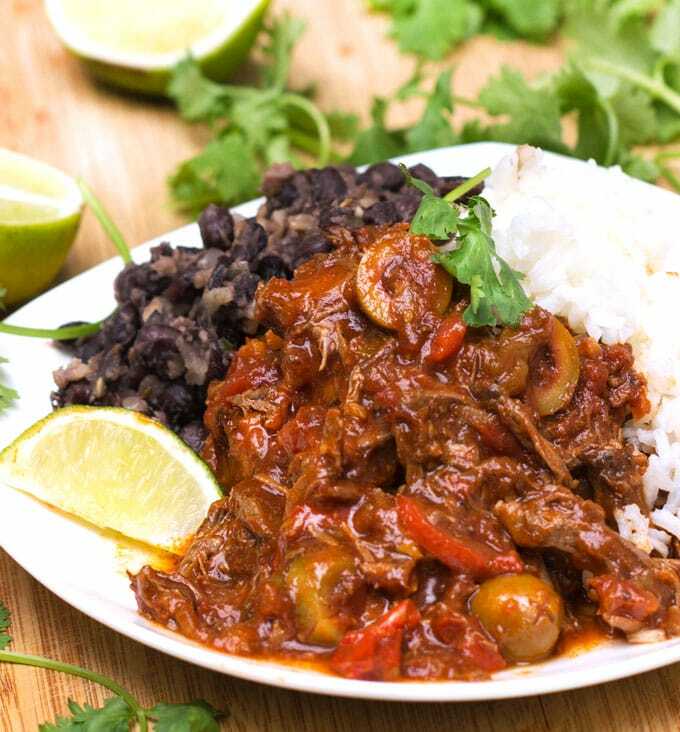 It’s traditional to serve ropa vieja with rice and black beans. Fried plantains are often on the side as well. Plain white rice will do just fine. There’s plenty of flavor in the stew. But if you’re interested, here’s what I did to take the rice up a notch: sauté a teaspoon of minced garlic in a tablespoon of olive oil for 30 seconds in a saucepan. Add 1½ cups of raw white rice and cooked it, tossing, for about a minute, in the garlicky oil. Add 3 cups of water and a teaspoon of salt, cover and cook on low, per the package directions, about 15 minutes. Here’s a great recipe for quick cuban black beans. If you can get everything going in your crock pot in the morning, come dinner time, you’re in for a treat – a delightful tender stew, ready to ladle over a bed of rice! 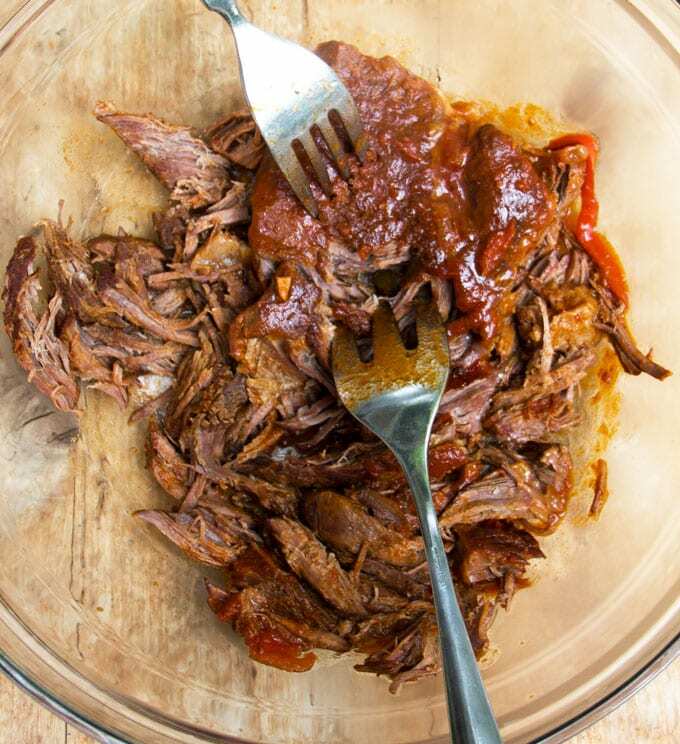 Here’s the recipe for slow cooker ropa vieja. If you make this I hope you’ll come back to leave a comment and let me know how it turned out. If you’re in the mood for more great crock pot recipes, check out this roundup of delicious healthy summer slow cooker recipes from Cooking Light. This was unbelievable delicious, the only change I made was using regular chicken broth versus low sodium and 1/4 cup olives instead of half. Cuban is my favorite type of food and this is the best Ropa Vieja I have had, and I am not a cook by any means. Because of this prep took me a while about an hour to cut all the veggies and cook everything before the crock pot. Thank you so much for the recipe really delicious! I’m so glad you enjoyed Jenny! Made this on Monday and I can’t even tell you how much we love it!!! Since I turned it on when I went to work I had it on low for 10 hours. My house smelled ah-ma-zing when I got home and my husband called it restaurant quality. Thanks so much for sharing this recipe! Ate the left overs last night and I already can’t wait to make it again. I just made this! And my house smells so good! We are having guests for dinner and can’t wait to taste it. I think I’m going to cook on low for more hours like someone else did since it’s 8am lol. Thanks so much!! Yay – I’m so happy to hear this Lisa!! okay guys, I’m not a chef, don’t spend time in the kitchen – my partner is the inspired cook. Wanted to surprise him with a dish after a long day at work. HE WOKE UP TODAY STILL RAVING. Absolutely delish! Beautifully layered flavors, easy prep, and it leaves your house smelling wondrous all day. I skipped the white rice and did cauliflower rice instead for a low carb option. Also did your take on the black beans and will never eat another plain can again! BRAVA! I am Cuban born, so I basically looked up 15 recipes before making my dish and this one is a great “backbone” to keep in hand. (After years of relying on my mom and aunt it was time to make it on my own). If you love traditional ethnic food I suggest “Cocina al minuto” by Nitza Villapol for Cuban food btw, shes our Julia Child. But keep in mind its based around the resources the country had available at that time (meaning we can often make yummier versions because our options are less limited, and some of the ingredients listed probably don’t even exist in our world). Also thank you for suggesting traditional Cuban side dishes for those who are unfamiliar with the culture. I’ve been using my slow cooker a lot lately and I was looking for something new to try when I stumbled across this recipe. I thought it sounded good and I made it as written (even though I did a double take when I read it needed to be cooked on high for 6hrs). 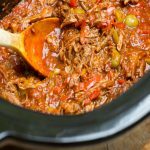 This is probably the best slow cooker recipe I have come across! It was delicious! The depth of flavor and complexity are hard to come by in slow cooker recipes. I will definitely make this again and will be trying your other recipes. Thanks so much! Yay! I’m so glad to year you enjoyed the Ropa Vieja so much Brittany 🙂 I hope you have great results with some of my other recipes. Keep me posted! I made this recipe before and it was a huge hit! I need to make this before work, so it will be in the slow cooker longer than 6 hours. I will be home a couple of hours before my husband. Do you recommend still adding the olives and vinegar after 5 1/2 hours and letting it sit on the keep warm setting for the 3 hours before serving, or should I wait until 30 minutes before serving? Hi Lauren, I’m so glad the recipe was a hit! As for timing, it’s a pretty flexible – it will be delicious any way you do it. I would probably cook it for the full 6 hours and then add the Olives and vinegar 1/2 hour before serving and reheat it with them in it. But even if you just stir the olives and vinegar in right before serving, it will still be delicious! Ropa Vieja cooking in a crock pot makes your home smell soooo amazing!!!!! It seriously hits anyone who walks in the door. They all say OMG what is that cooking!!! My recipe is vey similar to this one, doesn’t use carrots but i will try them next time because I love carrots. I also use a beef broth over chicken and a packet of sazon seasoning. Sometimes I add a handful of frozen peas towards the end. To those who have never made this… It is a very versatile dish, don’t be afraid to use what you have on hand. This was very tasty even though I thought it was missing just a bit of richness. I had used a leaner cut of beef and a little less salt. Served it with black beans and garlicky brown rice. “2 cups good quality canned tomato puree (such as Muir Glenn organic)” – 2 cups, really? Do you mean crushed tomatoes? Or more like tomato paste? Not sure they sell tomato puree in Sweden. You can substitute crushed tomatoes or you can puree canned whole tomatoes in your blender or food processor. Enjoy! You had me as soon as you said olives and vinegar. Love those flavors! This looks and sounds amazing! Is there another vinegar you can substitute for the white vinegar? We have almost every other type! Yes! Apple cider vinegar would be the closest match but you can use wine vinegar or even fresh squeezed lemon or lime juice. You want that sour acidic component. Enjoy! So I didn’t have any cumin or white dry wine. I did however have some Marsala cooking wine so I figured Id give that a shot…what effect do you think this will have on this recipe? Yours looks amazing by the way! Thanks for recipe! Marsala is a bit stronger and sweeter than dry white wine but my bet is your Ropa Vieja will be just as delicious. And even without the cumin I think you’ll be fine. There are so many other delicious ingredients in the mix. Let me know how it turns out! Lisa, thank you so much for this! It was absolutely incredible! You’ll see a little write up about it on my blog! But thanks again! What a winner! I am going to make this soon. The recipe sounds wonderful. I love Cuban food. I made a Cuban Mojo Pork roast yesterday. Thank you for sharing. Hi, I was wondering what size slow cooker you made this in? Thanks! Hi Alise, I have the All-Clad 6 1/2 quart slow-cooker. Delicious! I am making this for the third time in less than two months- it is really easy but has amazing flavor and depth. We serve it over rice, and it is even better the next day! Is it possible to freeze all uncooked ingredients together, then cook in a slow cooker at a later time? Trying to prepare easy meals before my twins come. Thanks! I’m not sure that would work. I think it would be best if you cook up a big batch of ropa vieja and freeze it in individual portions. Then all you have to do is reheat it and cook up some rice on the side. Delicious! I used beef broth and cabernet instead along with a small can of diced chilis! Thanks for the recipe! Delicious recipe, and I have tried quite a few. Substituted boneless, skinless chicken thighs (non meat eating guests) and added a teaspoon of Spanish smoked paprika. This one is going on my favorites list! Add some tomato sauce to your black beans and they will be even more delicious! This looks incredibly yummy and I’m making it today. I noticed that the cooking time is “high” for 6 hours. Usually, crockpot cooking time is “low” for 6 hours or “high” for 4 hours. Just wanted to double check with you that this is correct. Thanks! Hi Melanie, Yes, it’s correct. It may be unconventional but that’s how it ended up working best for me. I hope you enjoy!! I put it in the slow cooker this morning at 8am and then realized 6 hours on high would make it done at 2PM! so I cooked it on low for 9 hours and it was delish! Great! I’m glad to know there’s another way to achieve delicious results! I don’t think I ever cooked something from the cuban cuisine, so this one will be my first. Can’t wait to taste it, it looks so delicious on the pictures. Thanks for the recipe! Your blog is amazing! Your slow cooker version made this dish so accessible to many! Looks like our next dinner for sure! Yum! I love stews like this…definitely going to have to try it! I have a feeling it will be a huge hit here! Yep, definitely drooling over here. This looks stinking AMAZING, and I love that it’s made in the slow cooker. Perfect for weeknight dinner or in a big batch for family parties! Love! I’ve often seen ropa vieja in magazines and on menus, but I haven’t had the vaugest idea how it was made. As always, you come through with an accessible version that seems authentic but not intimidating. This recipe looks fabulous for a large gathering, or to freeze in portions for hectic weeknights. If it’s dry sherry I think it will work well!